Both semi-finals in the Bedfordshire Women’s County Cup fell victim to the weather last weekend, held a week later it will be a repeat of last season’s final with Luton Town Ladies taking on the current holders Bedford Ladies on Sunday 17th March. Luton Town Ladies were playing their first game at their new home The Brache, Luton Town FC’s training facility. Were taking on AFC Kempston Town & Bedford College Ladies from Beds & Herts Women’s Division Three, a good test for the lower league side the newcomers to woman’s football playing 5 leagues lower than their FAWNL South East Division One opponents. Held Luton for nearly 40 minutes before the hosts took a quick two goal lead at the end of the first half. Dionne Manning making it 1-0, Erica Byron doubling the lead a minute later. Jess McKay extending Luton’s lead 12 minutes into the 2nd half. Into the last 20 minutes an the hosts were awarded a penalty Byron adding her 2nd of the game from the spot. McKay made it 5-0 soon after. Further chances came Luton’s way the woodwork struck twice before captain Zara Carroll’s long range strike found it’s way into the back of the net. 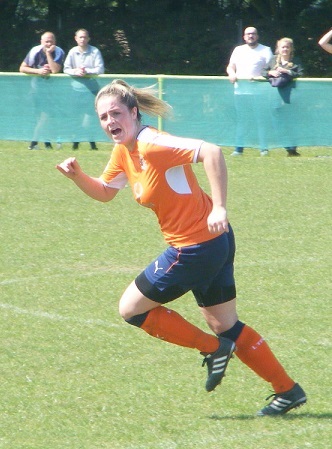 McKay completing her hat-trick in the final minute to wrap up a 7-0 win for Luton. In the other semi-final in the Bedfordshire Women’s County Cup it was an all ERWFL Premier Division clash with holders Bedford Ladies away to AFC Dunstable Ladies on Sunday. Goals from Michelle Byrne, Amy Magnus and Eden Kibron seeing Bedford safely into the final where they will be aiming to retain the cup for a 2nd successive year against a Luton side keen to get the cup back in their trophy cabinet themselves. Venue and kick-off time to be announced. New leaders in Beds & Herts Women’s Division One with Northwood Ladies climbing to the top of the pile in what is a competitive tussle for the title. Northwood playing in one of the two games to survive in the league on Sunday were away to Sherrardswood Ladies. A comfortable scoreline taking Northwood ahead of Welwyn Pegasus Sapphires on goal difference. Emma Steele leading the goal scoring charts netting a hat-trick against Sherrardswood to take her onto 14 for the season. Danielle Tyler scoring her 10th goal of the season along with a goal each for Leanne Jones & Samantha May in a 6-0 win. Houghton Athletic Ladies in 4th were taking on 6th placed Sharnbrook WFC in the league on Sunday, both in a good position to put pressure on the sides above shared the points at the weekend the game ending all square a 1 goal a piece. Ciara Craig on target for Houghton Athletic with Claire Smith celebrating the goal for Sharnbrook. Two of the scheduled 5 matches in Beds & Herts Women’s Division Two fell foul to the elements including leaders Hitchin Town Ladies game away to 4th placed Letchworth Garden City Eagles that presented an opportunity for 2nd placed Hitchin Belles to close the gap to the leaders to just 2 points if they could secure victory at home to Wheathampstead Wanderers Ladies. Hitchin Belles getting the result they wanted a strong first half saw them leading 4-0 matched that tally 2nd half. There is a battle going on for top scorers and all the contenders waded in with goals this Sunday, Katie White edging it scored a hat-trick to take her onto 14 for the season, Amy Jack and Charlotte Peters hot on her heels both netting a brace against Wheathampstead have 12 each. Gemma Smith also getting her name on the scoresheet for her 1st goal of the season. Royston Town Ladies Development were away to bottom side Welwyn Pegasus Azures on Sunday. The 3rd placed side too with an opportunity to put pressure on the leaders. Had to settle for a point in the finish as Welwyn picked up their first competitive point of the season their previous points awarded. Scoring twice to match Royston whose goals were scored by Abby Laughlin and Nicole Cooper. Evergreen Ladies 5th in Division Two were on the road on Sunday taking on Bedford Ladies Development, the visitors taking the lead through Ellie Smith only for Bedford’s Joanne Makin to equalise. Rebecca Freeman sending a free-kick into the top corner to restore Evergreen’s lead with her 7th goal of the season and ultimately the winning goal for Evergreen. Three matches in Beds & Herts Women’s Division Three at the weekend with away wins for the top two seeing them extend their lead at the top of the table. Leaders AFC Dunstable Ladies were taking on bottom side Bedwell Rangers Women. The visitors holding a narrow lead at half-time Bianca Vassell’s 26th goal of the season in the 19th minute the difference between the two sides. Bedwell Rangers coming right back into it in the 66th minute as Rachel Young struck to make it 1-1. Closing in on the final 15 minutes and Dunstable edged themselves back into the lead Kerry Mulvihill-Reed making it 2-1, the 3 points secured deep into injury time with Lakeisha Fazilahmed making it 3-1 in the 95th minute. An equally close score for 2nd placed Woburn & Wavendon Lionesses as they clinched the 3 points away to Langford Ladies on Sunday. 2nd versus 3rd Giselle Randall’s 14th goal of the season the difference between the sides Woburn & Wavendon winning 1-0. In the other game played in Division Three on Sunday 5th placed Biggleswade United Ladies secured the 3 points with a 2-0 win at home to Stotfold Juniors Ladies. This entry was posted in Bedfordshire Women's County Cup, Beds & Herts Women's Division One, Beds & Herts Women's Division Three, Beds & Herts Women's Division Two, The Round-Up and tagged Bedfordshire Women's County Cup, Beds and Herts Women's Division One, Beds and Herts Women's Division Three, Beds and Herts Women's Division Two, The Round-Up on January 30, 2019 by WFEast. A busy start to 2019 across the Beds & Herts Women’s Football leagues, however this edition of The Round-Up begins with the Bedfordshire Women’s County Cup. Two of the 4 quarter final ties postponed back in December due to the inclement weather scheduled for this Sunday, big tests for Beds & Herts Division One sides, Houghton Athletic Ladies and Sharnbrook WFC as they were drawn against higher league opposition. Houghton Athletic were away to ERWFL Premier Division side Bedford Ladies, the current holders of the County Cup. Two leagues apart Bedford were beginning the defence of their trophy and proved too strong an opponent winning comfortably in the finish. Michelle Byrne scoring twice for Bedford with a further 5 players all getting a goal each, Paige Abraham, Carissa Kaczorowski, Setor Acolatse, Amy Magnus and Lauren Murray in a 7-0 win. Sharnbrook WFC were at home in the quarter final of the County Cup taking on FAWNL South East Division One side, Luton Town Ladies, keen to get the County Cup back after losing out to Bedford in last season’s final. Bottom of South East Division One the County Cup a welcome distraction for Luton and hopefully a spring board to improved results in the new year. Plenty of youngsters in the Luton squad and it was one of them that opened the scoring in the 11th minute with Aurora Ryan making it 1-0. The visitors pressing the play Sharnbrook defending held them at bay before Ryan found the back of the net for her 2nd of the game in the 33rd minute, Dionne Manning adding a 3rd goal for Luton 5 minutes from the end of the 1st half. Luton were in control Olivia Abraham scoring her 1st goal for the side to make it 4-0, captain Zara Carroll making it 5-0 just past the hour scoring from a free-kick. Another debut goal following with Maddison Goodenough celebrating her 1st Luton goal 2 minutes later. Rachel Kosky scoring a 7th for Luton with 15 minutes left time for 2 more with Remi Bains getting her name on the scoresheet a screamer from Jess McKay wrapping up a 9-0 win. 2019 begins and all of a sudden it’s beginning to look very tight at the top of Beds & Herts Division One. The league rarely disappoints with title drama and after Sunday’s results there is just 3 points between the top 5 sides. Welwyn Pegasus Sapphires have gotten the games in where others haven’t and good form saw them move into top position in the league start 2019 top were at home on Sunday up against Hemel Hempstead Town Ladies in 3rd position, a brace from Lizzie Richardson enough to edge the win 2-1 to Hemel Hempstead to climb up into 2nd spot and close the gap on Welwyn to just a point with 4 games in hand. Also closing the gap on the leaders are Northwood Ladies starting the year with an away win against bottom side Garston Ladies 1st team. A trio of goal scores with Zamina Rehemtulla, Emma Steele and Danielle Tyler all finding the back of the opponents net in a 3-0 victory. Northwood in 4th now 3 points behind the leaders and like Hemel Hempstead have games in hand. So too do defending champions St Albans Ladies, 3 goals in the last 10 minutes securing the 3 points at home to Sherrardswood Ladies. Nicola Dark with the early goal for St Albans putting them 1 nil up in the 8th minute it wasn’t until the hour that St Albans scored again dark netting her 2nd of the match. The result made comfortable late on with the game entering the final 10 minutes Ellen Slater getting the goal to make it 3-0. 3 minute from time and Eleanor Lovelock struck to make it 4-0 with Michaela Johnson scoring the home sides 5th goal in stoppage time. St Albans in 5th have 13 points like Northwood and yes you guessed it games in hand on the leader. In Beds & Herts Division Two it was a great start to the season for Hitchin Town Ladies as they end 2018 with a 9 point lead at the top of the table. Have played more games than those hoping to chase them down, their main challenger being fellow Hitchin side, Hitchin Belles in 2nd spot 9 points a huge gap Hitchin Belles have 3 games in hand. Began 2019 with and away trip to Watton Ladies. The hosts battling hard were leading 2-1 at the break. Hitchin regrouped at half-time and an improved performance saw them find the back of the net 4 times to run out 5-3 winners at the final whistle. Katie White scoring a brace, Keira How, Chloe Keller and Charlotte Peters the other goals scorers for Hitchin Belles. Gemma Bickell with two and Karly Lundy with her 1st of the campaign scoring the Watton goals. Royston Town Ladies Development climb up into 3rd place in the Beds & Herts Division Two table with a 4-0 home win over Evergreen Eagles Ladies on Sunday. Kelly Yarwood getting on the scoresheet with her first goal for Royston’s Development side netting twice. Nicole Cooper and Abby Laughlin also on target with a goal a piece. The title race in Beds & Herts Division Three was hotting up well before the New Year with Langford Ladies setting the early pace, the new side chased by fellow newcomers AFC Kempston Town Ladies & Bedford College Ladies and AFC Dunstable Ladies Development the latter still undefeated charging into top spot whilst a newly merged Woburn & Wavendon Lionesses side see Bedfordshire sides dominating. AFC Dunstable Ladies Development have a striker in their ranks in red hot form, Bianca Vassell with 20 goals from 10 appearances going into this Sundays game away to Buntingford Town Ladies. Is now 25 goals from 11 s she hit 5 more at the weekend. Shanice Sanderson making her debut for Dunstable celebrated the occasion with a goal with Lakeisha Fazilahmed also getting a goal in a 7-0 victory. Woburn & Wavendon Lionesses keep the pressure on Dunstable in 2nd spot remain just a point behind as they edged the victory away to Biggleswade United Ladies this Sunday. A hat-trick from Giselle Randall for the visitors enough to cancel out strikes from Sarah King and Leeanne Davison to win the 3 points for Woburn & Wavendon. 10 goals in her last 4 league games now for Randell including 3 successive hat-tricks. Games in hand on all the sides above them 4th placed AFC Kempston Town & Bedford College Ladies into the Bedfordshire County Cup in their debut season a 4th in the table close the gap to 3rd placed Langford to 2 points with an away victory this Sunday. Started 2019 with a trip to Bedwell Rangers Ladies. Goals from Chloe Urbanowicz, Bex Cray and Zara Garrard securing a 3-0 win for the visitors. This entry was posted in Bedfordshire Women's County Cup, Beds & Herts Women's Division One, Beds & Herts Women's Division Three, Beds & Herts Women's Division Two, The Round-Up and tagged Bedfordshire Women's County Cup, Beds and Herts Women's Division One, Beds and Herts Women's Division Three, Beds and Herts Women's Division Two, The Round-Up on January 9, 2019 by WFEast. The final edition of The Round-Up in 2018, ending with the weekends action from Beds & Herts including the quarter finals of the County Cups. Storm Deirdre playing its part as it did across the region affecting fixtures everywhere. Two of the 4 quarter finals from this season’s Bedfordshire Women’s County Cup were played on Sunday with the other two postponed. Both featuring Dunstable. The 1st team were hosting Beds & Herts Division Three side Woburn & Wavendon Lionesses at home in the competition. Dunstable struggling in the ERWFL Premier Division, Woburn & Wavendon showing good form in Division Three a huge gulf between the sides 4 leagues to be exact. Dunstable coming out on top getting a good win. Storm Sherrie Burrows scoring a hat-trick for Dunstable. Rachel Moffat also amongst the goals netting a brace with Sophie Bailey also claiming a goal in a 6-0 win to take Dunstable into the last 4. In the other quarter final, it was an all Beds & Herts Division Three clash with AFC Kempston Town & Bedford College Ladies at home to league leaders AFC Dunstable Ladies Development. Both enjoying a strong start to the season. Kempston Town with the early lead getting in front inside the opening 10 minutes, held that advantage going into the 2nd half. Dunstable getting themselves back on level terms 7 minutes into the 2nd period Nicole Cameron scoring to make it 1-1. The visitors going on to take the lead themselves with the game entering the final 15 minutes Lakeisha Fazilahmed with her 1st goal of the season. The lead didn’t last long however with Kempston Town soon back on level terms. A dramatic end with the winning goal coming in the 90th minute, Kempston Town scoring it to win 3-2 and reach the last 4 of the County Cup in their debut season. Taylor Kingston scoring twice with Kimberlee Aldred also on the scoresheet. One outstanding tie from the quarter finals of the Hertfordshire Women’s County Cup postponed last Sunday, this weekend ERWFL Premier Division side were away to Watford Ladies U23s playing in the FAWNL Reserves South/South East Division. Watford going strong in the competition recording a 5-0 win to reach the last 4 where they will have a home tie on Sunday 20th January against Beds & Herts Division One side, Hemel Hempstead Town Ladies. Two games played in Beds & Herts Division One this Sunday. 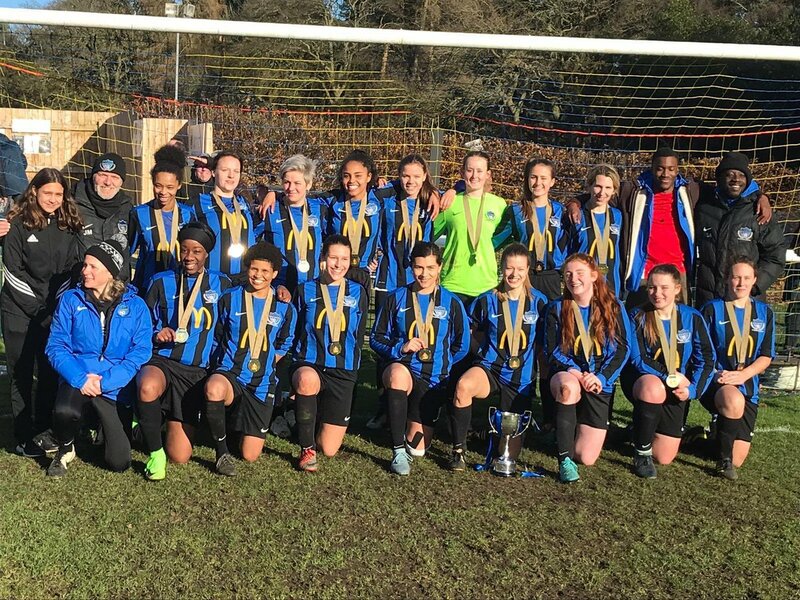 Welwyn Pegasus Sapphires ending 2018 top of the pile but far from the result they would have wanted as they lost heavily away to Northwood Ladies. Danielle Tyler and Megan Warner both scoring a hat-trick in the game. Warner making her 1st start making a huge impact. Emma Steele with a goal keeps her just out in front of Tyler as top scorer with 9 now. Holly Gilder also scoring in an 8-0 victory. Northwood up to 4th on the Division One table a cluster of sides mid-table 3rd to 6th separated by just 2 points all with games in hand on the top two. Joining Northwood Ladies on 10 points are 5th placed St Albans Ladies a slow first half to the season for the defending champions with just their 5th league game played this Sunday were at home to bottom side Garston Ladies 1st team. Ellen Slater scoring twice for St Albans has 9 for the season now, Nicola Dark and Molly Slade also getting a goal a piece in a 4-2 win. Emma Trill with both the Garston goals. One game taking place in Beds & Herts Division Two this Sunday with leaders Hitchin Town Ladies away to bottom side Welwyn Pegasus Azures. Hitchin starting well taking the lead in the 14th minute Kirsty Smith lobbing the keeper from 20 yards out. 3 minutes later Hitchin were 2 up with Louise Gash finding the back of the net. On the half hour Welwyn pulled a goal back, Rebecca Bullar scoring to make it 2-1. Hitchin responding straight away two quick fire goals from Gash seeing her complete a 1st half hat-trick joins captain Emma Chaffey as the clubs top scorer on 8 goals. A 4-1 lead to Hitchin at half-time. The woodwork coming to the rescue for Welwyn in the 2nd half Chaffey 1st from a penalty then Gash with two efforts. A 5th goal finally coming in the 80th minute. Natalie Thompson the goal scorer the win seeing Hitchin 9 points clear of 2nd placed and local rivals the Belles who like all the chasing pack have games in hand but right now it has been a great opening half to the season for Hitchin Town. This entry was posted in Bedfordshire Women's County Cup, Beds & Herts Women's Division One, Beds & Herts Women's Division Two, Hertfordshire Women's County Cup, The Round-Up and tagged Bedfordshire Women's County Cup, Beds and Herts Women's Division One, Beds and Herts Women's Division Two, Hertfordshire Women's County Cup, The Round-Up on December 19, 2018 by WFEast. Saved the biggest Round-Up till the last with the sides splitting to compete in their individual County Cup competition this Sunday both at the 2nd Round stage in Bedfordshire and Hertfordshire. Three matches taking place in the 2nd Round of the Bedfordshire Women’s County Cup the winners joining, Houghton Athletic Ladies, Sharnbrook WFC, AFC Dunstable Ladies, Luton Town Ladies and current holders Bedford Ladies in the quarter finals. The top two in Beds & Herts Women’s Division Three meeting for the 1st time this season in the County Cup, leaders Langford Ladies away to AFC Kempston Town & Bedford College Ladies. The home side having the better of the first half leading the game 2-0, Langford fought back in the 2nd half with Amber Clark and Chloe Scott both getting a goal, AFC Kempston Town & Bedford College, finding a 3rd goal in the 2nd period edging their league rivals out to win the game 3-2. Also riding high in Beds & Herts Women’s Division Three are AFC Dunstable Ladies Reserves sitting 3rd level on points with AFC Kempston Town & Bedford College Ladies and like them kept up their unbeaten start to the campaign with victory in the 2nd Round of the County Cup. Away to Stotfold Juniors Ladies this Sunday, top scorer Bianca Vassell moving onto 15 goals for the season as she found the back of the net for another 4 goals. Madison Ashford also on target with a brace, Ameerah Zaman-Choudary on the scoresheet too in a 7-0 win for Dunstable. Bedfordshire sides dominating the top of Beds & Herts Women’s Division Three, 4th placed Woburn & Wavendon Lionesses were at home to 6th placed Biggleswade United Ladies in the 2nd Round of the County Cup, a 7 goal thriller between the sides, Kayleigh Saunders hitting a brace for Biggleswade with Helen Coster scoring the visitors 3rd. A brace from Laura Sephton along with a goal each for Victoria Harrold and Giselle Randall seeing Woburn & Wavendon edge the game to book their spot in the quarter finals. 8 ties in the 2nd Round of the Hertfordshire Women’s County Cup this Sunday and those saw plenty of goals scored too. Cup holders, Stevenage Ladies were drawn at home taking on Hitchin Belles a tough test for the Beds & Herts Women’s Division Two side but despite their being a 4 league gap between themselves and FAWNL South East Division One, Stevenage they gave it a go. Stevenage proving too strong on the day running out comfortable winners, scoring 16 goals without reply to progress to the quarter finals. Charlotte South hit a double hat-trick for Royston Town Ladies as the ERWFL Premier Division side eased through at home to Bishops Stortford Ladies in the 2nd Round of the County Cup on Sunday. There was also a hat-trick for Sammy Tinsley along with a brace for Joanne Rutherford, Samantha Edgar also scoring in a 12-1. 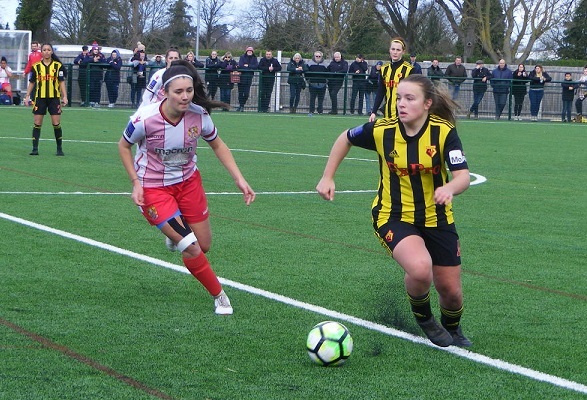 12-1 was also the winning margin in the 2nd Round of the County Cup for Watford Ladies U23s side at home as they won comfortably against Stevenage Ladies Reserves on Sunday to book their place in the quarter finals. Beds & Herts Women’s Division One side Garston Ladies 2nd XI were also big winners at home in the competition on Sunday as they took on Division Three side, Bedwell Rangers Ladies. Ruby Jager getting on the scoresheet for 4 goals for Garston, Holly Jury 1 behind with a hat-trick, their were goals too for Lauren Berryman, Leah Crockett, Chloe Hazell and Charley Kelsey. Garston reaching double figures didn’t have it all their own way however as Bedwell Rangers struck home 3 goals at the other end with, Alicia Fieldsend, Chloe Jones and Rachel Jones all getting a goal each. Garston winning 11-3. Garston Ladies young guns are also through to the quarter finals of the Hertfordshire Women’s County Cup after their U18s side won 3-0 at home to Sherrardswood Ladies in the 2nd Round this Sunday. Colney Heath Ladies from the ERWFL Premier Division were away to Beds & Herts Women’s Division One champions, St Albans Ladies in the 2nd Round of the County Cup this Sunday. Sophie Gardener scoring for Colney Heath midway through the 1st half putting the visitors into the lead. That the score at half-time Colney Heath had further chances to extend their lead. Nicola Hollick making it 2-0. Rianne Townsend-Brown adding a goal to the tally securing the win for Colney Heath as they reach the last 8. Hemel Hempstead Town Ladies are also into the Hertfordshire Women’s County Cup quarter finals as they edged their 2nd Round tie away to Watford Ladies Development on Sunday. leading 2-1 a half-time both sides scoring a further goal 2nd half Hemel Hempstead going through 3-2. Natasha McConville, Louise McCoy and Kayleigh Baker with their goals. Hoddesdon Town Owls Ladies reached the final of the Hertfordshire Women’s County Cup last season, needed extra-time to progress in this season’s competition, at home on Sunday taking on Beds & Herts Women’s Division One leaders, Welwyn Pegasus Sapphires. Janiece Allen and Ellie Burke scoring a goal each for Welwyn, as goal late in each half from Natasha Crick her 2nd 5 minutes from time seeing the sides drawing 2-2 at the final whistle. Onto extra-time and time was running out for either side to find a winner penalties looming, 3 minutes left of open play and Hoddesdon found the back of the net for the winning goal, Crick again completing her hat-trick to send Hoddesdon through to the quarter finals. A handful of league games too played at the weekend, one game in Beds & Herts Women’s Division One, Garston Ladies 1st team at home to Houghton Athletic Ladies on Sunday. 3 straight defeats in the league at the start of the season for Garston seeing them bottom of the table were taking on a Houghton Athletic side looking to get back to winning ways themselves after a run of 3 straight defeats themselves after a promising start to the campaign. Despite a brace for Emily Watson for Houghton Athletic it was Garston who were celebrating at the final whistle as they won the game 3-2 to claim their 1st league points, Janine Rodgers, Yasmin Sabri and Kelly Spencer with the winning goals. In Beds & Herts Women’s Division Tow their were 4 league matches taking place on Sunday, and with leaders Hitchin Town Ladies not in action it was a chance for 2nd placed Letchworth Garden City Eagles to close the 4 point gap. Letchworth away to Bedford Ladies Development. Tayla Murray scoring twice her 7th & 8th goals of the season and a first goal of the campaign for Natalie Moey making her first appearance of the season securing a 3-1 victory. Letchworth with a game in hand on the leaders. Evergreen Ladies join Sunday’s opponents on 8 points in Beds & Herts Women’s Division Two were at home to 3rd placed Royston Town Ladies Development. A single goal the difference, Natalie Maher’s goal winning it for Evergreen Ladies. A first league win of the season on Sunday in Division Two for Evergreen Eagles as they won away to Watton Ladies. Sian Owens and Amy Marshall striking the back of the net for Watton, Evergreen Eagles breaching their opponents goal for double that tally with, Samantha Feeney, Katie Hendry, Jessica Taylor and Paige Lacey-Akers all getting on the scoresheet in a 4-2 win. A 2nd successive league win on Sunday sees Wheathamstead Wanderers Ladies move up into mid-table following promotion from Division Three, were at home playing fellow promoted side Welwyn Pegasus Azures. Wheathampstead Wanderers picking up the 3 points courtesy of a 5-2 victory. This entry was posted in Bedfordshire Women's County Cup, Beds & Herts Women's Division One, Beds & Herts Women's Division Two, Hertfordshire Women's County Cup, The Round-Up and tagged Bedfordshire Women's County Cup, Beds and Herts Women's Division One, Beds and Herts Women's Division Two, Hertfordshire Women's County Cup, The Round-Up on November 21, 2018 by WFEast. Semi-finals weekend in the Bedfordshire Women’s County Cup this Sunday. Luton Town Ladies dominating the competition in recent season’s were at home taking on local rivals AFC Dunstable Ladies. A league between the sides Luton Town had already knocked Dunstable out of the FA Women’s Cup earlier in the season 4-0 then it was much tighter this time around. 0-0 at the break Luton Town took the lead in the 2nd half Nicola Henman’s cross turned into the back of the opposition net for an own goal. 1-0 soon became 2-0 as Luton Town were awarded a penalty Zara Carroll stepping up to score from the spot. Samaira Khan pulling it back to 2-1 with 10 minutes left gave the visitors hope of getting back into the game, Luton Town held out to reach the final once again. Luton Town Ladies opponents in the Bedfordshire Women’s County Cup Final will be Bedford Ladies. The ERWFL Premier Division side coming out on top against Houghton Athletic Ladies from Beds & Herts Women’s Division One. Bedford progressing courtesy of a 4-0 win in the finish with 4 different names in the scoresheet with a goal, Olivia-Rose Cunningham, Carissa Kaczorowski, Eden Kibron and Zoe Molloy. A good weekend for Beds & Herts Women’s Division One leaders St Albans Ladies and that was without kicking a ball as their closest rivals 2nd placed Northwood Ladies lost for the 3rd time this season away to Garston Ladies who themselves won for just the 3rd time this season. The home side winning the match 3-2 thanks to a last minute free-kick. Garston winning the match despite Northwood scoring twice in the last 20 minutes through Danielle Taylor and Leanne Jones. For the 2nd successive Sunday, Flitwick Ladies earned a point another good result away from home this time up against Sharnbrook WFC. The game finishing 0-0 to sides sharing the points Flitwick with 6 games left to play will look to build on their recent performances to try and get their 1st league win of the season. Sharnbrook remain in 4th place in the table have 5 left to play. New leaders in Beds & Herts Women’s Division Two as, Welwyn Pegasus Ladies move into top spot ahead of Garston Ladies 2nd XI who saw their match at home at the weekend postponed. Welwyn Pegasus were at home to 3rd placed Royston Town Ladies Development who themselves could have gone top of the table with a win. A competitive tussle the sides sharing 10 goals between them. A hat-trick for Becky Shephard for Royston Town, along with a goal for Megan Evers, 4 goals weren’t enough however to take anything from the game as the hosts found the back of their net for 6 goals. Top scorer Chemise Huitson scoring 5 goals in the match to move onto 17 for the season. Georgina Harvey getting the other goal to ensure the 3 points were won. Remains very tight at the top of the Division Two table. Hitchin Town Ladies moving right back up onto the tails of the top 3 as they won the Hitchin derby away to Hitchin Belles on Sunday. A close 1st half seeing the sides drawing 0-0 at the break it was Hitchin Belles who opening the scoring a minute into the 2nd half Katie White with the goal. On the hour Hitchin Town equalised, Emma Chaffey putting the ball home after a Jessica McNamara effort came back off the post. McNamara herself then scored to give the visitors the lead with 20 minutes left to play. Dani Friel extending the lead to 3-1 with a goal inside the last 10 minutes. Late hope for Hitchin Belles of rescuing a point a White struck again to reduce the deficit to 2-3 Hitchin Town holding on for the 3 points. Just 4 points between the top 4 in the table. In 5th place in the Beds & Herts Women’s Division Two table Letchworth Garden City Eagles won for the 5th time this season away to bottom side Woburn & Wavendon Lionesses Blues on Sunday. A 2-0 win seeing the 3 points go to the away side. Also very tight at the top of Beds & Herts Women’s Division Three as Wheathamstead Wanderers Ladies win their 3rd straight league match to move level on points with Bedford Ladies Development on Sunday, 4 wins if you include the cup. Wheathamstead were away to Evergreen Ladies, Sophia Pidgeon moving onto 32 goals for the season as she found the back of the net for 5 goals in a 6-1 victory. Mary Quest also a goal for the visitors her 1st for Wheathamstead. A first goal too for Bianca Contonicola for Evergreen Ladies. 2 points dropped for leaders Bedford Ladies Development as they had to settle for a share of the points away to 4th placed Woburn & Wavendon Lionesses Clarets on Sunday. 0-0 at half-time, Bedford captain Jessica Bunnage scored early in the 2nd half to give the visitors the lead her 16th of the season. Charlotte Demmon equalising for Woburn & Wavendon midway through the half with her 7th goal of the season. Was also a draw between Shefford Town & Campton Ladies in 5th at home to bottom side Potters Bar United Ladies on Sunday. 2-2 the final score Mandy Morgan with both goals for Potters Bar United who are the first side this season to play out their league fixtures. A tough season some close defeats early on no points on the board ended strongly earning 5 of their 6 points in their last 3 matches a positive end to their season. This entry was posted in Bedfordshire Women's County Cup, Beds & Herts Women's Division One, Beds & Herts Women's Division Three, Beds & Herts Women's Division Two, The Round-Up and tagged Bedfordshire Women's County Cup, Beds & Herts Women's Division One, Beds & Herts Women's Division Three, Beds & Herts Women's Division Two, The Round-Up on February 21, 2018 by WFEast. Semi-finals time in the Hertfordshire Women’s County Cup, delayed a week due to the poor weather affecting the region last weekend. It was a repeat of last years final with Stevenage Ladies winners last season at home to Royston Town Ladies. A league between the sides FAWPL South East Division One side, Stevenage had the better of the 1st half but were unable to find the back of the net against their ERWFL Premier Division opponents. A goal early in the 2nd have set Stevenage on their way to victory, Ashleigh Deacon putting the ball into the back of the net, more chances followed before Stevenage doubled their lead, Leah Littlechild getting the goal. A penalty scored by Chloe Gunn sealing a 3-0 win and sending Stevenage into their 4th successive final the aim this year to try a successfully defend the trophy. 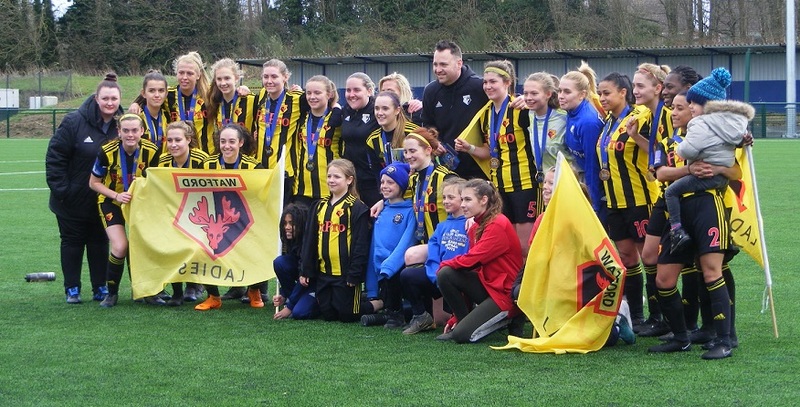 Stevenage’s opponents in this season’s Hertfordshire Women’s County Cup final will be Hoddesdon Town Owls Ladies reaching the final for the 1st time. The ERWFL Division One South side at home to Beds & Herts Women’s Division One leaders, St Albans Ladies in the semi-finals. St Albans 8 months unbeaten going into the match. Two goals from Natasha Crick with a goal each for Kristina O’Connell, Rosy Wodhams and Charley Handley seeing Hoddesdon win the game 5-2 to reach the final. Eleanor Lovelock and Jordan Williamson with the 2nd half strikes for St Albans. The Hertfordshire Women’s County Cup Final will be played on the 11th March at the County Ground in Letchworth. Women’s Football East will be there. It was quarter finals weekend in the Bedfordshire Women’s County Cup competition again delayed due to the poor weather last weekend. Bedford Ladies already through due to Sandy Ladies folding earlier in the season that left 3 ties to be contested. It was as far apart in the women’s football pyramid as you could get in one quarter final with Luton Town Ladies, Bedfordshire’s premier women’s side playing in FAWPL South East Division One and holders of the County Cup away to Beds & Herts Women’s Division Three side Woburn & Wavendon Lionesses Clarets on Sunday. Luton winning comfortably to progress, Natasha Fensome top scoring in the game with 5 goals. Nicola Henman netting a hat-trick, there was a brace each for Kim Farrow and Dionne Manning. Also getting a goal each in the game were, Lisa Nixon, Rachel Kosky, Jess McKay, Stephanie Gale and Zara Carroll the final score 17-0. Luton Town Ladies Development side were also in action in the quarter finals of the County Cup drawn away to Beds & Herts Women’s Division One side Houghton Athletic Ladies. Luton were leading the game 1-0 when the game was stopped due to a serious injury to Houghton’s Ciara Craig an ambulance called the game abandoned. Terrible news and Women’s Football East wishes Ciara all the best for a speedy and full recovery. The game rescheduled. ERWFL Premier Division side AFC Dunstable Ladies were also taking on Beds & Herts Women’s Division One opponents in the quarter finals of the County Cup, Sharnbrook WFC the visitors to Creasey Park. Goals from Danielle Carty and Charlene Moreton securing a 2-0 win for Dunstable to send them through to the semi-finals. Both games scheduled to be played Sunday 18th Febraury. One game played in Beds & Herts Women’s Division One this Sunday with 3rd placed Sherrardswood Ladies playing their 1st game of 2018 at home to bottom side Watton Ladies. Both Laurie Marris and Laura Cousins getting 2 goals each in the 1st half before going on to complete their hat-tricks in the 2nd. Manjinder Atwal also on target in the 2nd half with Sherrardswood running out 7-2 winners, moving them 5 points behind 2nd placed Northwood Ladies with 2 games in hand. It was 3rd v 4th in Beds & Herts Division Two on Sunday with Royston Town Ladies Reserves away to Hitchin Town Ladies. It was the hosts who opened the scoring Jessica McNamara putting them 1-0 on 11 minutes. Just past the half hour Royston came right back into the match equalising then going into the lead just 3 minutes later scoring from two free-kicks, Grace Leslie and Harriet Smith the scorers. Hitchin were quick to reply however the lead lasting just 4 minutes as Emma Chaffey got it back to 2-2. That the half-time score. One the hour Hitchin retook the lead Dani Friel scoring. The 3 points made safe 2 minutes from time Megan Franklin scoring from 30 yards to make it 4-2 the 3 points enough to move Hitchin above Royston into 3rd on goal difference. Evergreen Eagles also move up a place in the Beds & Herts Women’s Division Two table after winning at home on Sunday going above opponents Hitchin Belles into 6th. Samantha Takis putting Evergreen 1-0 on 20 minutes it was 2-0 2 minutes later Samantha Feeney getting the goal. Holly Williams making it 3-0 on the half hour. Abbey Williams extending the lead 20 minutes into the 2nd half. Takis scoring her 2nd of the game 20 minutes from time to seal a 5-0 victory. In Beds & Herts Women’s Division Three, 2nd placed Wheathamstead Wanderers Ladies cut the gap to leaders Bedford Ladies Development to 5 points with a comfortable home win on Sunday. Taking on Shefford Town & Campton Ladies the winning margin 6-0. Sophia Pidgeon scoring all 6 of Wheathamstead’s goals moving her on to 24 goals from 10 appearances. Wheathamstead in good form have 2 games in hand on the leaders. Also in action on Sunday in Division Three were the bottom two Bedwell Rangers Ladies looking to extend the gap from bottom side Potters Bar United Ladies. Holly Walker scoring in the 10th minute for Bedwell. Jessica Sullivan also getting a goal in the 1st half went on to complete her hat-trick in the 2nd half. Leah Tomlin and Faye Prout also getting a goal each with Bedwell winning the game 6-3 their 3rd win of the season moving them 8 points ahead of Potters Bar United, their goal scorers Carly Gilbey and Mandy Morgan who scored a brace. This entry was posted in Bedfordshire Women's County Cup, Beds & Herts Women's Division One, Beds & Herts Women's Division Three, Beds & Herts Women's Division Two, Hertfordshire Women's County Cup and tagged Bed & Herts Women's Division One, Bedfordshire Women's County Cup, Beds & Herts Women's Division Three, Beds & Herts Women's Division Two, Hertfordshire Women's County Cup, The Round-Up on January 31, 2018 by WFEast. Sad news to start this week’s Beds & Herts Round-Up, struggling for numbers at the start of the season Sandy Ladies of Beds & Herts Women’s Division One have took the hard decision to call it a day. After 14 seasons ended last season winning the nearly formed Chris Renshaw Trophy. A real shame a talented squad had the pleasure of watching them on a couple of occasions wishing everyone at the club all the best for the future and hope to see as many as possible continue in the game and hopefully one day Sandy will return to women’s football. Across both counties this weekend all the action was from the County Cup in Bedfordshire the 1st Round was being contested between 8 sides looking to join, Luton Town Ladies (the current cup holders), AFC Dunstable Ladies. Bedford Ladies and Sandy Ladies in the quarter finals. Beds & Herts Division One side Sharnbrook WFC were at home in the 1st Round taking on Division Two side Woburn & Wavendon Lionesses Blues. Hoffi Pursey scoring an early goal for Sharnbrook in the 6th minute, 2 quickfire goals from Stephanie Hettle and Charlie Mullins on the hour mark had Sharnbrook in control of the tie. Mullins adding a 2nd goal to her tally with 20 minutes left. Pursey also claiming a brace netting another goal in the 83rd minute to see Sharnbrook progress with a 5-1 win. Georgie Payne with the Woburn goal. An all Division One clash in the 1st Round of the Bedfordshire County Cup between Flitwick Ladies at home to Houghton Athletic Ladies on Sunday the away side getting the result to progress, Emily Wilson hitting a brace with goals form Louise Spendelow and Holly Thomson in a 4-0 win. Bedford Ladies Development at home to Woburn & Wavendon Lioness Clarets was an all Beds & Herts Women’s Division Three clash in the 1st Round of the County Cup, the sides all square at the break drawing 1-1 both goals coming within a minute of each other just past the half hour mark Joanne Makin on target for Bedford, Alexandra Mitchell scoring for Woburn. The visitors going on to win the tie in the 2nd half with Lauren Revell giving Woburn the lead on the hour mark Charlotte Demmon making it 3-1 with 20 minutes left the Clarets reaching the quarter finals. Bed & Herts Division Three side Shefford Town & Campton Ladies were at home to Luton Town Ladies Development in the 1st Round of the County Cup a 6-0 defeat seeing them exit the competition at the weekend. 8 ties played in the 1st Round of the Hertfordshire Women’s County Cup this Sunday with Hemel Hempstead Town Ladies, Evergreen Eagles and Garston Ladies all awarded a walkover to progress into the 2nd Round. County Cup holders Stevenage Ladies began the defence of their trophy away to Beds & Herts Division Two side Garston Ladies 2nd XI. 4 leagues between the sides Stevenage overpowering their opponents attackers Leah Littlechild and Nicole Emmings both scoring a hat-trick. Chloe Gunn getting a brace. The goals were shared out elsewhere with Amy Josland, Rebecca Scola, Ellie Searle, Kristi Burling and Dominique Godbeer all finding the back of the net in a 14-1 win. Stevenage Ladies Reserves side also progress in the Hertfordshire County Cup taking their fantastic league form away to Letchworth Garden City Eagles on Sunday. A brace for Emily Scofield, along with strikes from Hannah Marshall and Rebecca Brooker seeing them beat the side from Beds & Herts Division Two 4-0. Royston Town Ladies last season’s beaten finalists are also through to the 2nd Round of the County Cup winning away from home against Watford Ladies Development who themselves won the competition 2 seasons ago. Goals from Samantha Edgar, Hayley Graham and Abby Laughlin sealing a 3-0 victory for Royston Town. ERWFL Division One South side Hoddesdon Town Owls Ladies won comfortably at home to progress in the County Cup on Sunday taking on Beds & Herts Division Three side, Welwyn Pegasus Azures. Kristina O’Connell netting a hat-trick in the match. Summer Muir claiming a brace with goals too for Leah Dunnage, Courtney Smart, Charlotte Grogan and Sian Owens in a 9-0 win. Not such good news for ERWFL Division One South side Bishops Stortford ladies as they exit the County Cup in the 1st Round knocked out by lower league opposition, short on numbers Bishops Stortford were hosting Beds & Herts Division Two side Welwyn Pegasus Sapphires. Goals from Danielle Aken, Chemise Huitson and Sophie Mandel seeing the Sapphires win the tie 3-1. Brogan McHale scoring for Bishops Stortford. Another side causing an upset on the County Cup were Beds & Herts Division Three bottom side Potters Bar United Ladies at home on Sunday taking on Watton Ladies bottom of Division One. Goals form Charlotte Caswell and Lauren Englefield sealing a narrow 2-1 win for Potters Bar. 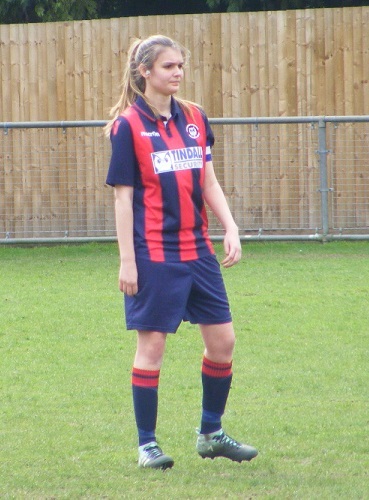 Bedwell Rangers Ladies from Beds & Herts Division Three were leading Division One side Sherrardswood Ladies 1-0 at half-time in their County Cup 1st Round tie the away side scoring in the 25th minute Megan Wybrow with the goal. Sherrardswood started the 2nd half strongly, Manjinder Atwal levelling the scores on 50 minutes a quickfire spell of 3 goals putting Sherrardswood on top on 57,58 and 60 minutes, Atwal with her 2nd of the game, Laurie Marris and Francesca Novelli also on target. Bedwell Rangers threatened a comeback Holly Walker then Jessica Sullivan making it 4-3. Into the last 10 minutes of the game and Atwal struck again to complete her hat-trick then a 4th a couple of minutes later to seal a 6-3 result. Also advancing into the 2nd Round of the Hertfordshire Women’s County Cup are Beds & Herts Division Two side Hitchin Belles winning 4-2 away from home against Bishops Stortford U18 Girls. Chloe Keller scoring a brace with Charlotte Peters and Charis Wakefield also scoring. The draw for the 2nd Round of the Hertfordshire Women’s County Cup features 8 ties to be played Sunday 12th & 19th November. This entry was posted in Bedfordshire Women's County Cup, Hertfordshire Women's County Cup, The Round-Up and tagged Bedfordshire Women's County Cup, Hertfordshire Women's County Cup, The Round-Up on October 18, 2017 by WFEast. The Hertfordshire Women’s County Cup isn’t too far away the date for your diaries Sunday 12th March a 3pm KO between Stevenage Ladies & Royston Town Ladies at the County Ground in Letchworth. County Cup semi-final day on Sunday in the Bedfordshire Women’s County Cup too and it’s going to be a repeat of last season’s final with both Cup Holders, Luton Town Ladies and runners-up Offley & Stopsley Women winning to reach the final. Although it took a 90th minute equaliser and a penalty shootout for the County Cup Holders to progress. Luton Town Ladies were at home hosting Bedford Ladies, Nicola Henman gave Luton Town the lead in the 1st half scoring in the 34th minute. Bedford pulled it back to 1-1 7 minutes into the 2nd half, Charlene Moreton with the goal. The visitors going on to take the lead as the match closed in on the 70th minute Olivia-Rose Cunningham scoring. The lead lasting just 5 minutes before Rachel Carter headed home from a corner to make it 2-2 into the last 10 minutes and again Bedford edged themselves int a 3-2 lead Moreton with her 2nd of the game. Couldn’t see out the result Luton Town finding a reply in the 90th minute, Erica Byron firing the ball into the back of the net to see the game end 3-3 and go straight to penalties, Luton Town winning the shootout 4-3 to reach the final. ERWFL Division One side, Offley & Stopsley Women were drawn away to Beds & Herts Women’s Division One side, Sharnbrook WFC in the semi-finals of the Bedfordshire Women’s County Cup. Gemma Franklin putting the lower placed league side 1-0 up in the 10th minute of the game. Giselle Randell equalised for Offley & Stopsley on the half hour to see the sides go into the changing rooms level at 1-1 at half-time. Offley & Stopsley took the lead early in the 2nd half, Katerina Hamplova scoring to make it 2-1, Kelly Randall added another goal for the visitors 15 minutes into the 2nd half with Giselle Randall getting her 2nd goal of the game with 15 minutes left to see Offley & Stopsley into the County Cup final with a 4-1 win. Beds & Herts Women’s Division One leaders, Sandy Ladies were seeing the sides below them narrow the gap after they had suffered 2 successive league defeats, were looking to get back to winning ways thus Sunday with a tough away trip to in form Bishops Stortford Ladies who had moved into 2nd place 3 points behind them in the table. A hat-trick fr Kirstie Gavin along with a goal for captain Katie Seldon saw Sandy get back to winning ways taking all 3 points with a 4-2 win. Brogan McHale scoring for Bishops Stortford plus an own goal. All very tight at the top of Beds & Herts Women’s Division One and 3rd placed St Albans Ladies took full of Bishops Stortford Ladies defeat having lost to them just last Sunday to win big at home this Sunday against 4th placed Sherrardswood Ladies. The visitors took an early lead Laura Cousins on 6 minutes, however that was as good as it got for Sherrardswood. Ellie Lovelock scoring the equaliser midway through the 1st half. Sophie Monahan made it 2-1 before half-time. In the 2nd half St Albans went goal crazy, Kayla Johnson grabbing a goal 3 minutes after the restart. Monahan with her 2nd of the game plus an own goal put the home side 4-1 up. Johnson netting a 2nd goal in the 68th minute. Katherine Hutton joined the goalscorers on 77 minutes. Megan Samuel, Suzanne Read and Monahan completing her hat-trick all scoring in the final 10 minutes. Hutton had time for one more goal in injury to to seal an 11-1 win and climb back into 2nd in the table. Garston Ladies also took advantage of Bishops Stortford’s loss to move above them in the table into 3rd spot. Were playing away on Sunday against 2nd bottom side Hitchin Town Ladies Jane Hales, Bobbi Rhodes, Lucy Zecchin and Kelly Kirwan all finding the back of the net plus an own goal sealing the 3 points with a 5-0 win. 8 league games in Beds & Herts Women’s Division One without a single point on the board bottom side Letchworth Garden City Eagles caused something of an upset 2 weekends ago beating the league leaders Sandy Ladies at home 3-0 to record their 1st win of the season, now like a bus two come along at once as they win at home for the 2nd successive league game to move level on points with Hitchin Town Ladies. Taking on Houghton Athletic Ladies Tayla Murray’s brace was enough to win the 3 points with a 2-1 result, Holly Thomson scoring for Houghton Athletic. Remains as tight at the top as ever in Beds & Herts Women’s Division Two with the top 5 still separated by just 2 points. An ever changing picture the league has a new leader this week with Watton Ladies going top after inflicting a heavy defeat on previous leaders Hitchin Belles. Having gone top of the table themselves a depleted squad suffered defeat last weekend at home to Woburn & Wavendon Lionesses Clarets, were short on numbers again as they travelled to play Watton Ladies. The home side taking full advantage to lead 6-0 at half-time going on to get the 3 points with a 8-1 win, Francesca Smithers scoring 4 goals to move onto 25 for the season. Chloe Jones with 17 goals to her name so far this season also grabbing a goal with Beth Willing, Gemma Penny and Kirsty Richardson on the scoresheet. Emma Wells with the consolation goal for Hitchin Belles. Watton go top level on points with Hitchin Belles however Watton have 3 games in hand. Panshanger Ladies move back up into 3rd spot a point behind the leading pair with an away win against bottom side Evergreen Ladies on Sunday. Ellie Burke giving the visitors the lead in the 1st half Chemise Huitson added another goal in the 2nd half to secure a 2-0 win but not before both sides had a player red carded late on. Two matches in Beds & Herts Women’s Division Three at the weekend. 2nd placed Evergreen Eagles winning away from home to close the gap on leaders Woburn & Wavendon Lionesses Blues to 3 points. Were taking on Wheathamsted Ladies who scored twice in the game captain Sophia Pidgeon with both the goals. Samantha Takis netting twice for Evergreen, an own goal the decider the 3-2 win for Evergreen giving them the 3 points. 3rd placed Potter Bar United Ladies also won away from home at the weekend a single goal from Janiece Allen seeing the 3 points won at Shefford Town & Campton Ladies. Finally and sadly it appears the leagues in the East have lost another side this season with Hatfield Town Ladies in Beds & Herts Division Three showing in the table with 0’s all the way. The 18th side to disappear from the regions leagues this season very concerning and I’m getting tired of reporting it. Hope everyone at Hatfield stays involved in the game in some format. This entry was posted in Bedfordshire Women's County Cup, Beds & Herts Women's Division One, Beds & Herts Women's Division Three, Beds & Herts Women's Division Two, Hertfordshire Women's County Cup, The Round-Up and tagged Bedfordshire Women's County Cup, Beds & Herts Women's Division One, Beds & Herts Women's Division Three, Beds & Herts Women's Division Two, Hertfordshire Women's County Cup, The Round-Up on February 22, 2017 by WFEast.